Philipp was born in Germany in 1965 and came to Canada as a one-year-old with his family. He grew up in Saskatoon where he was fascinated with animals from a young age. Philipp first did a bachelor's degree in biology at the University of Saskatchewan before deciding to go into veterinary medicine there. Philipp met his wife, Lorraine, at the veterinary college and when they graduated in 1990 they moved to Winnipeg, Lorraine’s hometown. He has been at Birchwood ever since then. Lorraine now works part-time at Academy Spay and Neuter Clinic. Philipp has advanced training in diagnostic ultrasound and for the last fifteen years has had the largest ultrasound referral practice in Manitoba. He has seen in excess of 12,000 ultrasound cases, both abdominal and cardiac (echocardiography). His other special interests in practice are cardiology, oncology and internal medicine. He has also been the chair of the provincial Peer Review Committee (professional discipline) for a number of years. 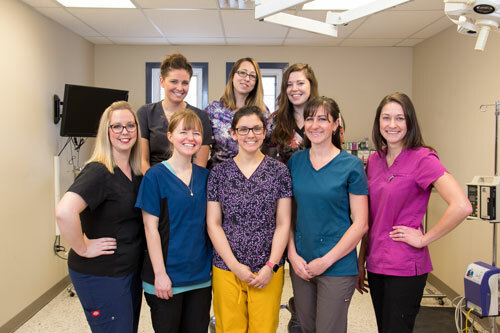 Philipp was named Manitoba Veterinarian of the Year in 2009 and was presented the Award of Merit by the Manitoba Veterinary Medical Association in 2015. Philipp and Lorraine have two children, Isabel and Alexander and two cats, Lucy and Gabi, as well as Orbit, a Shetland Sheepdog. In his spare time Philipp loves to travel, read, write, blog, cook, brew beer, cycle and hike, among other things! Dr. Andrea Robertson grew up in Winnipeg and did her undergraduate studies at the University of Winnipeg. She worked at Birchwood the summer of 1999, before her final year of veterinary school, as a veterinary preceptor. She returned to Birchwood upon graduation from the Western College of Veterinary Medicine in May 2000. Her interests include soft tissue surgery, neurology and ophthalmology. She is currently completing her training to become certified in animal physiotherapy and rehabilitation. Away from work, Andrea spends time with her husband, three young sons, two Labrador retrievers, and three Siamese cats. She enjoys spending time at the cottage, hiking, cooking and soccer. Dr. Jillian Preston grew up in Winnipeg and completed her BSc in Biology at the University of Winnipeg. She came to Birchwood in June 2002 after graduating from the Western College of Veterinary Medicine, and is now one of the practice owners. She has a passion for Veterinary Medicine, especially in the field of wellness, nutrition and behaviour. She especially enjoys watching kittens, puppies and rescue animals as they mature into beloved family members, and following them into their senior years. Jillian is involved with the community and currently serves on the board of the Companion Animal Health Fund and is a leader with a local meditation group. Her other involvement has included being the primary shelter veterinarian at D’Arcy’s ARC from 2004 to 2016, finish line volunteer with the WPS Half Marathon, being on the selection committee for the veterinary college and volunteering with Royal MTC. She is an enthusiast of the Winnipeg arts scene, and enjoys travel. She currently lives in Winnipeg with her husband and three rescue dogs. Dr. Brad Safiniuk was born and raised in Winnipeg, Manitoba. He graduated from St. Paul’s High School with the Governor Generals award in 1991. He then attended the University of Manitoba and earned an Honours degree in Zoology before backpacking through Australia, New Zealand and Hawaii with his girlfriend, whom he later married. When he returned to Winnipeg he began a Master’s of Science degree in Zoology specializing in American White Pelican behaviour before he was admitted to the Western College of Veterinary Medicine in Saskatoon. He completed the MSc during the summer following the first year at WCVM. He graduated in 2003. Brad's particular area of expertise and interest in practice is surgery. He has a son, and a Husky/Border Collie/Sheltie cross dog named Skye. He is an avid sports fan and enjoys traveling and spending time outdoors with his family. Brad has worked at Birchwood Animal Hospital since 2005. Dr. Leanne Boyd was born and raised in Winnipeg. She went to high school at Silver Heights Collegiate and did her Bachelor of Science degree in Zoology at the University of Manitoba. After a year of work and travel, she moved to Saskatoon to do her Masters in Comparative Animal Physiology. She worked concurrently on her Masters while at the Western College of Veterinary Medicine and finished both degrees in 2005. While at the WCVM, she helped initiate the Global Vets program in which students travel to a developing country to practice veterinary medicine after their 2nd year. She has had the opportunity to practice vet med in both Peru (Global Vets,summer 2003) and Africa (Uganda rotation 2005). Leanne started working part time at Birchwood in the fall of 1994 as a veterinary assistant and receptionist, and was a preceptor student at the clinic in the summer after her third year of vet school. After becoming a veterinarian, she started back at Birchwood in March of 2007. Leanne's particular area of interest in practice is dentistry and she is a member of the Academy of Veterinary Dentistry. She enjoys travel, the outdoors/nature, reading and plays many sports. She and her husband very much enjoy spending time with their son and daughter, and share their home with two cats. Stacey was born and raised in Manitoba and attained her undergraduate science degree at the University of Manitoba, with a major in Zoology and a minor in Environmental Science. She then moved to Saskatoon to complete her Doctorate at the Western College of Veterinary Medicine. Stacey has always had an interest in wildlife and exotic animal medicine. She worked at the Assiniboine Park Zoo and held a job in the wildlife rehabilitation field while in school. During her studies she also completed externships at both the Calgary Zoo and the Assiniboine Park Zoo. Stacey also spent a summer taking part in Global Vets, where she traveled to Uganda, Africa and volunteered with the Predator Cat Program and with the endangered mountain gorillas. Today she gets her wildlife fix seeing patients for the Prairie Wildlife Rehabilitation Centre here at home. Consequently Stacey is also Birchwood's caged pet, bird and exotics veterinarian and will see almost any species you care to name. Almost. She is of course always happy to see dogs and cats too. She lives happily with her husband Ryan, her two children, her dog Pepsi, and her two cats Gibson and Clifford. Lisa started with Birchwood as a receptionist in 1998. Since 2009 she has been our office manager, handling payroll, employee benefits, accounts receivable, payables, scheduling, client relations, reception supervision, general correspondence and a thousand and one other jobs that keep this place running smoothly. And from time to time you'll see her back at the reception desk as well, like twenty years ago, helping out and enjoying being around people and their animals, rather than paperwork and computers! "Today techs do practically everything except what the law reserves for veterinarians: diagnosing, prescribing and operating. Today, in our practice, techs take every blood sample, place every IV, take every xray, induce every anesthetic and perform every dental prophy and cleaning. Moreover, they command an in-house laboratory that looks like a miniature version of NASA Mission Control, they perform blood transfusions, they hook up ECGs, they monitor and care for critical hospitalized patients and they counsel clients on weight management, behaviour, post-operative care and a host of other subjects. And they do it all well. Very well. Each one is a medical nurse, an ICU nurse, an emergency nurse, a surgical nurse, a laboratory technologist, a nurse anesthetist, a dental hygienist, an xray technologist, a neonatal nurse and a palliative nurse... All of that, and more. In 1990 I could do absolutely everything in the clinic. I knew what every knob on every piece of equipment did and I knew how to make it do that. I knew exactly how to get blood on every patient (well, almost every patient) and I could wield every instrument and administer every treatment. Today I am more or less useless. Ok, I'm exaggerating for effect. More accurate is that I am useless without my techs. Absolutely useless and helpless." These are the smiling faces at the front desk and the friendly voices on the other end of the phone. They answer your questions, make your appointments, help you with your prescriptions and pet diets, prepare your estimates and take your payments. They greet your puppies and kittens on their first visits and the counsel you on arrangements when your pet's life journey has come to an end. Veterinary practice is very busy at times, but our receptionists manage the flow like professional air traffic controllers. Veterinary practice throws curve balls every day, but these women catch them like seasoned outfielders. They are our front line. They are the face of Birchwood Animal Hospital. They are the best, and we are very proud of them!